Home » Prostate Cancer » PSA Screening – Where are we now? Lonnie Silva’s story (Click here) of having to ask for a PSA blood test for almost 10 years, just to get a baseline and screen for prostate cancer is frustrating to read. Even more frustrating is that his first PSA came in at 22.1 after being denied a PSA for so long. Many of us know that even though Lonnie’s PSA screening struggle took place in the 90’s, the struggle is still real today for too many men. So – where are we now, in summer of 2016? 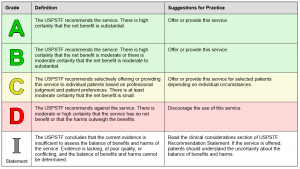 The good news is that the USPSTF is in the process of developing a new ruling for PSA screening. 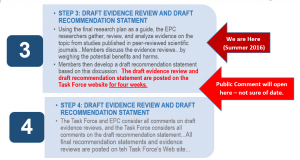 More good news is that in October 2015, at the very beginning of their process, they asked for input from the public and from medical professionals on how to compile their research. 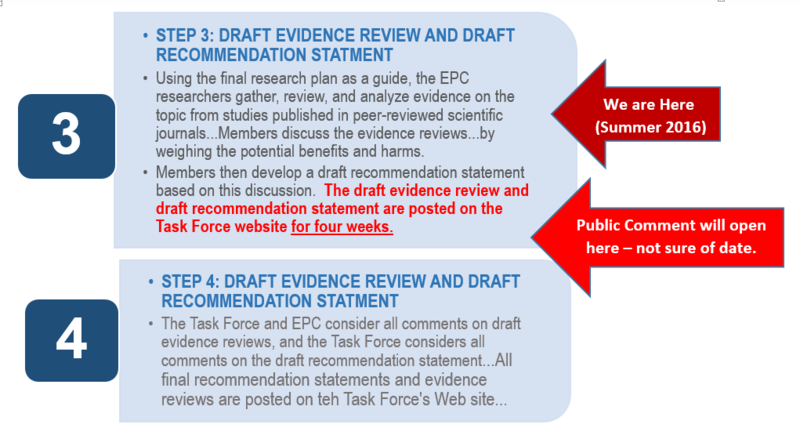 Based on the very robust response they received from many people and many organizations, they changed the way they were approaching this current research process for developing a new PSA recommendation, and issued this response in April of 2016. 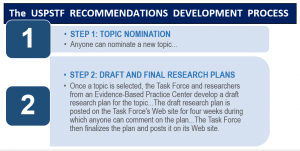 Here is a look at the Task Force’s process, and where we are in the new recommendation development. 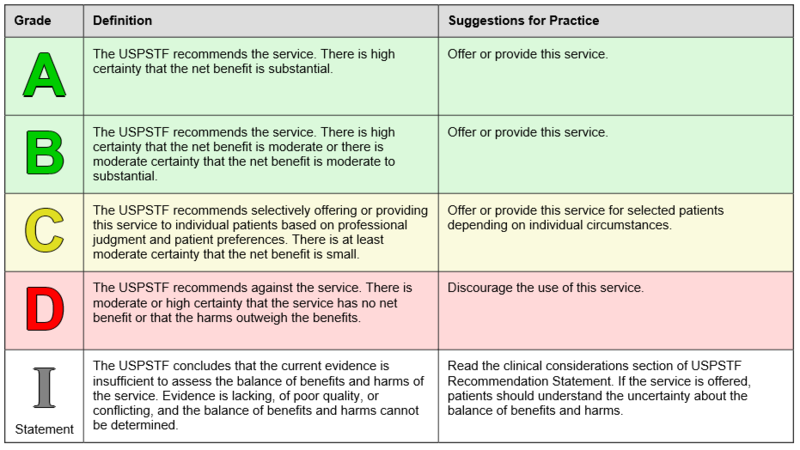 The bad news is that this USPSTF process for a new PSA screening recommendation will take more time, and it is difficult to predict how long (Figure 1.). A phone call to the media department of the USPSTF informed me that the entire process averages 2 ½ to 3 years from start to finish, although it could be shorter. If the process started October 2015, then 2 ½ years later would put us at April 2018. This is only the average expected time – hopefully it will be sooner than that. *If you would like to weigh in and comment on the Task Force’s upcoming draft recommendation for PSA screening, you can sign up for email alerts from the Task Force online at this link – http://www.uspreventiveservicestaskforce.org/Page/Name/email-updates . Although we do not know when public comment will open, we know it will be open for 4 weeks. PAACT recommends that you weigh in on the issue – post a public comment when it opens, and let your voice be heard. Watch PAACT’s Facebook page for updates. You can find us at www.PAACT.HELP, or call us at (844) PAACT 4U.